BUILDING – Acts 2:42, John 2:1-2, John 3:22. EQUIPPING – Matthew 4:18-22, Ephesians 4:11-12. 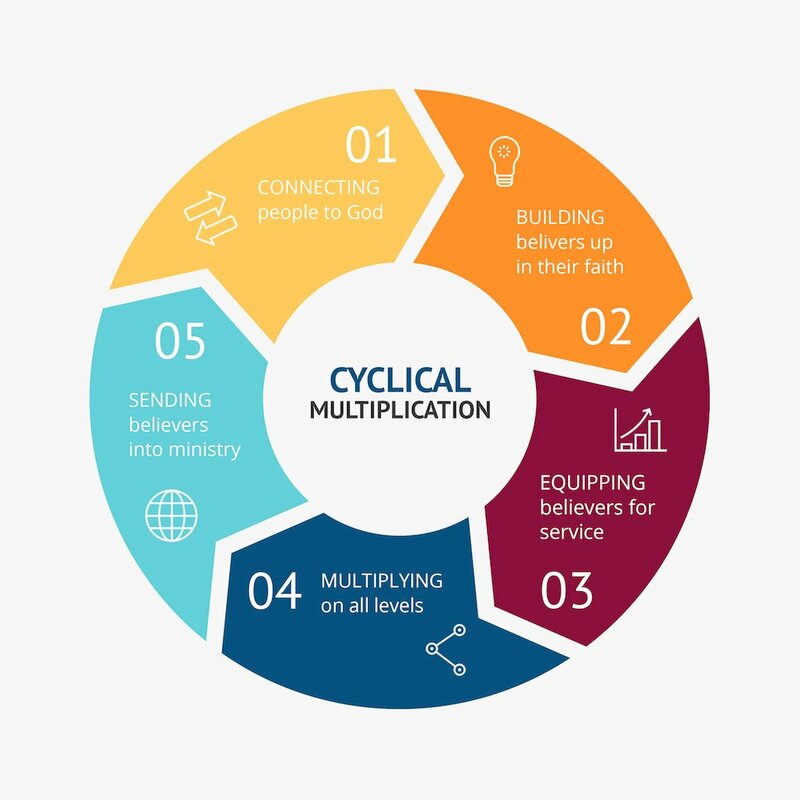 MULTIPLYING – Luke 6:12-13, Mark 3:7-8, Titus 1:5, Acts 14:1-28. SENDING – Luke 10:1-3, John 20:21, Matthew 28:18. We believe the Bible to be the inspired, the only infallible, authoritative Word of God revealing the love of God to the world. 1 Thessalonians 2:13, 2 Timothy 3:15-17, John 3:16. We believe that there is one God, eternally existent in three persons: Father, Son, and Holy Spirit. Matthew 28:19, John 10:30, Ephesians 4:4-6. We believe in the deity of the Lord Jesus Christ, in His virgin birth, in His sinless life, in His miracles, in His vicarious and atoning death through His shed blood on the cross, in His bodily resurrection, in His ascension to the right hand of the Father, and in His personal return in power and glory. Matthew 1:23, John 1:1-4 and 1:29, Acts 1:11 and 2:22-24, Romans 8:34, 1 Corinthians 15:3-4, 2 Corinthians 5:21, Philippians 2:5-11, Hebrews 1:1-4 and 4:15. We believe that all men everywhere are lost and face the judgment of God, which Jesus Christ is the only way of salvation, and that for the salvation of lost and sinful man, repentance of sin and faith in Jesus Christ results in regeneration by the Holy Spirit. Furthermore we believe that God will reward the righteous with eternal life in heaven, and that He will banish the unrighteous to everlasting punishment in hell. Luke 24:46-47, John 14:6, Acts 4:12, Romans 3:23, 2 Corinthians 5:10-11, Ephesians 1:7 and 2:8-9, Titus 3:4-7. We believe in the present ministry of the Holy Spirit, whose indwelling enables the Christian to live a godly life. John 3:5-8, Acts 1:8 and 4:31, Romans 8:9, 1 Corinthians 2:14, Galatians 5:16-18, Ephesians 6:12, Colossians 2:6-10. We believe in the resurrection of both the saved and the lost; the saved unto the resurrection of eternal life and the lost unto the resurrection of damnation and eternal punishment. 1 Corinthians 15:51-57, Revelation 20:11-15. We believe that the ministry of evangelism (sharing and proclaiming the message of salvation only possible by grace through faith in Jesus Christ) and discipleship (helping followers of Christ grow up into maturity in Christ) is a responsibility of all followers of Jesus Christ. Matthew 28:18-20, Acts 1:8, Romans 10:9-15, 1 Peter 3:15. We believe God’s plan for human sexuality is to be expressed only within the context of marriage, that God created man and woman as unique biological persons made to complete each other. God instituted monogamous marriage between male and female as the foundation of the family and the basic structure of human society. For this reason, we believe that marriage is exclusively the union of one genetic male and one genetic female. Genesis 2:24, Matthew 19:5-6, Mark 10:6-9, Romans 1:26-27, 1 Corinthians 6:9. We believe that human life is sacred from conception to its natural end; to that we must have concern for the physical and spiritual needs of our fellowmen. Psalm 139:13, Isaiah 49:1, Jeremiah 1:5, Matthew 22:37-39, Romans 12:20-21, Galatians 6:10.